Advertiser.ie - Sligo must be punished, but how? 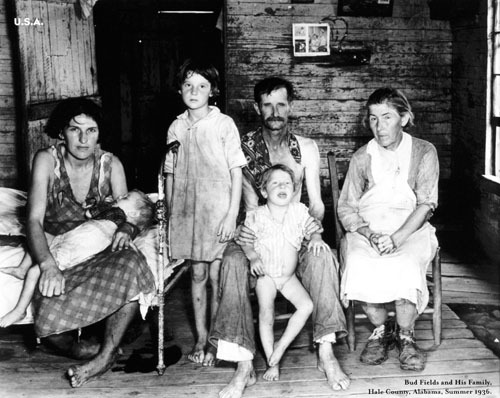 Hard times: Bud Fields and his family, Hale County, Alabama, summer 1936, part of the exhibition of photographs taken by Walker Evens, upstairs at the Aula Maxima, NUI,Galway. The Galway Arts Festival has become such an enormous event (in fact it is now an international event of significance ), that it is a bit like the Lisbon Treaty: You can’t see all of it; and while many of us see its value to the community, there are parts of it I don’t quite like. One of the things I don’t like is the visible disengagement of the business community with this explosion of good will and opportunity that has landed on our doorstep. The buzz in the city is bigger and better than ever this year. And at a time when sales in the high street have fallen, and there is a general reining in of personal spending, Galway is blessed to have this succession of great festivals: The Film Fleadh, the Arts Festival, and galloping towards us next week the amazing Galway Races. These are a gift horse to restaurants, hotels, bars and shops; yet if you walk through the main streets you don’t see many visible signs that all this is happening. Instead of taking all this for granted, the city should be festooned with bunting, flags and banners welcoming everybody to this annual madness and fun. Then up to the University College Hospital for a combined show featuring Allyson Keehan, Jennifer Cunningham, Joe McNicholas, Clare Henderson, Mike Dehelory, Louise Neiland, and Nicole Tilley. The introduction of art, music and storytelling is part of the mission of the Hospital Arts Trust to brighten long hospital corridors and walls with contemporary art that patients, staff and visitors can enjoy. Watch out for Cunningham’s deceptively easy everyday people, and O’Reilly’s beautiful Japanese-like etching ‘Succulent’. As you walk back to the main hospital entrance hall enjoy Mike Weekakoon’s wonder water clock. He presented it to the hospital ‘in appreciation to the people of Galway and their support to the poor communities of Sri Lanka’. Next I crossed over to the university where there are several exhibitions and presentations, but the venues in this large campus are not sufficiently highlighted. Some are difficult to find. However, as you walk into the Aula Maxima your eye is immediately caught by a video of a pair of hands moving rapidly around a glass globe; while behind a screen, a series of maps and buildings suffused in ice and light are a compelling visual image. These, and more, are by Galway born Ruth McHugh, and through the years I have seen this intelligent artist emerge stronger and with more confidence. Her exhibition Tracery could be seen as a new ice age, the reverse of global warming, which somehow emphasises the threat of change even more. And there close by, the artist shows the whole biodiversity of nature carefully displayed, dead and stuffed, as in a Victorian national history museum. It’s as if all earth’s creatures had passed away, but were preserved in a carefully laid out catalogue. It was one of the finest things I saw that day. Upstairs are a series of compelling photographs taken during the Depression 1935-1936 by Walker Evans. It is hard to believe that just over 70 years ago a depression was part of the American story. There is an interesting footnote on shoes. Because the man was working, or looking for work, he got a new pair of shoes when his old ones were worn out. The old ones were passed on to his wife which became her inheritance. Near by, in the university’s art gallery, is a series of videos by Bill Viola, a recognised pioneer of video art. There are chairs scattered about in the darkened room, and you sit where you like. Viola’s videos have the quality of a continuous painting. Their ultra slow motion gradually drew me into the picture, and when I eventually shook my head and stood up, I found I had been watching the screen for over one hour. One of the most pleasant walks in Galway is along by the canal, and I emerged at Dominick Street where I spent the second most absorbing time of the day at The Arts Centre, looking at Darkness Visible, which attempts through a variety of media to grasp the moment when darkness falls. This challenging theme is explored by Ann Mulrooney, Breda Lynch, Alice Maher, Eoin McHugh, Ailbhe Ní Bhriain, George Bolster, Andy Harper, Kate Street, and Angela Huntbach. You will never look at an orchid the same again after you see Street’s Margitte-like treatment; and Harper’s underwater world of Hieronymus Bosch. At the City Museum Joy Gerrard ‘s Strata was gratefully welcomed to the museum as a permanent fixture by Mayor Padraig Conneely. This is a striking constellation of suspended glass balls, which hangs at different levels from the top floor. When viewed from the ground floor up you see a thousand stars. Also on the second floor are Padraic Reaney’s interesting photographs of cottages in various stages of glory or decay. When Padraic was studying art at the RTC his morning bus passed thatched cottages along the Chois Fhairaige road. He sketched them, and entered the drawings for a special award in memory of Pádraic Mac Con Mhidhe. He won. With the prize money he bought a camera, and the took the photographs on display. Next to St Augustine Street and the Bold Gallery and its delicious series of prints by Annie West called Yeats on a train. Some of these are very funny indeed. Most of West’s 30 pictures illustrate WB Yeats’ rejected courtship of Maud Gonne, and with titles such as ‘Yeats arrives to Maud Gonne’s house to propose for the third time’, and ‘Joyce tells Yeats what he is doing wrong’ you get the picture so to speak. We have spent a lifetime listening to academics propounding on the literary merits of WB; and here is a chance for a bit of fun. Incidentally these are very reasonably priced at €350 each. Almost across the road is Kenny’s Art Gallery which is showing the most complete retrospective of any artist’s life’s work that I have ever seen. Pauline Bewick is one of Ireland’s best known artists, and over three floors of Kenny’s is devoted to glorious, sensuous paintings, telling her story from her drawings as a three-year-old, to the present. Luckily her mother kept everything she and her sister drew or painted, and wonderfully for us we can see the artist’s development through the decades. At St Patrick’s NS, Lombard Street is the annual Galway Art Club exhibition, and judging by the many entries you can only conclude that most people in the city are painting mad. I enjoyed the pictures of Mary Duffy, John Connolly, Breege Staunton, Pat Naughton, Bernie Walsh, Clare Duddy and Patsy Farrell. All these paintings are very reasonably priced, and could be a good place to start your collection. And finally, that day, I made my way to the wonderful festival office in the old Thos McDonogh building, Merchant’s Road. It really is an ideal building for an arts event, or possibly a large clattery restaurant. Apart from the staff busy selling tickets, and giving advice to tourists, there are three artists’ works on display. More Bill Viola’s videos, Joni Mitchell’s unusual treatment of news photographs, and the wonderful giant inflatable bodies by Canadian artist Max Streicher. I heard children literally squeal with delight! All the exhibitions continue until the weekend, and are free. So put the child in the buggy, and set out on your own voyage of discovery. I didn’t understand all that I saw, but I was very glad of the opportunity to try. PS. Watch out for Mart, a mixed media event in Silke’s, Sea Road, and at the sugar-pink thatched cottage on Henry Street. It wasn’t ready when I called, but I enjoyed a quick look around the cottage, an iconic building that somehow survived the ravages of time. It’s an event in itself.